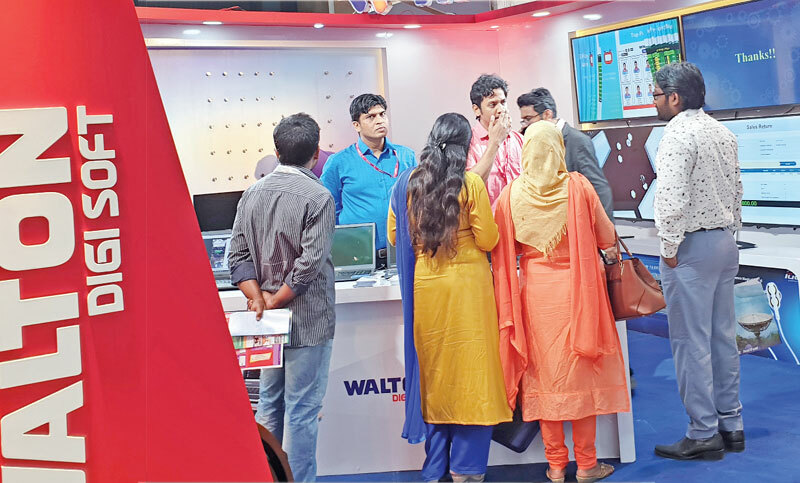 Customers throng Walton stall at the 15th edition of the BASIS SoftExpo 2019 that began at International Convention City Bashundhara (ICCB) in the capital on Tuesday. Walton took part in the 15th edition of the BASIS SoftExpo 2019 that began on Tuesday at International Convention City Bashundhara (ICCB) in the capital. Walton, for the first time, joined the county’s largest software exhibition to showcase its own software which has been named as DigiSoft, said a press release. The DigiSoft is a total business solution for small and large companies and enterprises. The software is being showcased at the Pavilion no. 3 of hall no. 2 in the fair. Liakat Ali, Executive Director and Head of Walton IT department, said: stakeholders will get four kinds of software solutions under DigiSoft which are CRM, POS, HRMS and Manufacturing and Administrative. CRM (Customer Relationship Management) is a software that helps to manage business and optimize relationships with customers and prospects. All kinds of customer related services including Call Center, Customer Care, Service and Accounts can be managed using it. POS (Point of Sale) is the place where a retail transaction is completed and manages sales transactions such as Purchase, Inventory, Sales, Accounting and VAT etc. Walton will also provide all necessary hardware solutions including server for smoot operation of the software. Special facilities will be given for those who will order the software at SoftExpo.